There were occasions during her round-the-world ride when Lea Rieck happily admits she returned to her hotel room and sobbed. The third and final leg of Lea’s tour took her from Australia – where her rider father had toured in the ’70s – to South America, the States, Canada and then back across to Morocco and western Europe. Almost two years earlier she’d set off from her native Germany to see the planet with a belief that she would become mentally strong, physically fit and a little bit tougher as a person. The reality was almost the exact opposite. Trust your ability. You will ride well and you will be able to communicate and get what you need. It isn’t a sign of weakness to turn back from a deep river or rocky road. Don’t be so stubborn that you create problems for yourself. It’s OK to ask for and accept help if you need food or directions. It can be a great icebreaker. Allow yourself to trust. Most people want to help a fellow human being. By trusting you will become softer yourself. We don’t actually need that much. The poorest people were often the kindest and wanted nothing in return. Ironically, it was on one of the most monotonous stretches of road in Argentina, from Buenos Aires to Ushuaia, where Lea was able to take stock of the previous year’s experiences: “The scenery to the southernmost tip is all quite similar, so it gave me time to meditate and think about what I’d experienced. Though now back in Munich, a kaleidoscope of images and memories return as she recalls the magical moments and lessons learned from more than 18 months on the road… and off it. After Asia where ‘you communicate using your hands and feet’, Australia was a welcome break. But for all the charms of Sydney, it was Tasmania that really stole Lea’s heart: “I reminisced on Skype with my dad about all the places he’d been, but Tasmania was something else and a must for all riders. After time in Australia, she shipped Cleo to Buenos Aires and flew ahead, where she was delighted by the laid-back Latin culture and had any preconceptions about crime shattered in double-quick time. She says: “You tend to ride in the countryside where the people all across South America are wonderful and can’t do enough to help you. The Andes was a highlight but Patagonia was great and had some really good and not too challenging off-road stretches. “The people in the countryside are wonderful even though they are poor. There were times during my trip when I got back to my hotel room and cried at what I’d seen. It’s changed me for the better,” she adds. Severe flooding in Peru forced Lea to freight her bike from Lima to Panama City – the only other way is through the notorious Darien Gap (one for another day) – to then head up through Honduras, Guatemala, Belize and Mexico to the States. 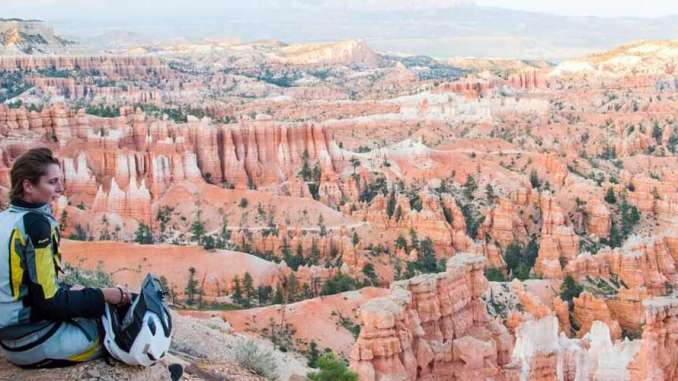 Two weeks in the ‘off-road paradise’ of Colorado’s Alpine Loop was the stand-out moment as Lea shed her loaded 60kg panniers and threw Cleo around before reloading and heading north to Newfoundland. “I rode up the west coast but missed out on Big Sur because there were landslides. By the time you’ve been to Yosemite and Yellowstone you’ve created lots of memories. My only regret heading up towards Alberta was that I didn’t get longer in Utah but it was 45 degrees, so maybe I’ll go back one day,” she says. After flying back to Morocco, where she hooked up with a friend to explore the Atlas Mountains, Lea made another discovery that shocked her when she least expected it: “I crossed into Spain and decided to go through the urban areas such as Madrid and Barcelona before heading through the Pyrenees and home.